I discovered today that The Canadan Register of Historic Places lists some very interesting details on the “Joseph Hickman House” and on the history of our Hickman family from New Brunswick, Canada. We have fond memories from the Hickman Family reunion held here in August 2005. 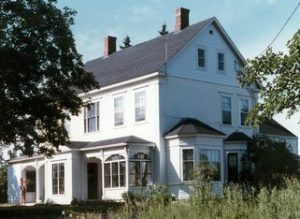 The Joseph Hickman House was designated for its association with the Hickman family, for its association with the ship building industry, for its association in the lumber industry, for its association with farming and for its architecture. The Joseph Hickman House is recognized for its association with the Hickman family. This large white house was home to five generations of Hickman’s. The house was built by Joseph Hickman (1821-1889) who married Ruth Caroline Wells in 1845. It was occupied by his son, John Howard (1859-1921), by his grandsons, William Marshall (1894-1952) and Robert Wells (1912-1975), and by his great-grandson Robert Stuart (1949- ) and his family. The Joseph Hickman House is also recognized for its association with the ship building industry. The Hickmans of Dorchester were merchants and businessmen, involved in politics and community organizations; however it is as shipbuilders that they acclaimed a world-renown reputation. In 1878, and for a few years thereafter, Canada could claim the fourth largest merchant marine in the world. Several coastal communities in New Brunswick, especially in the Bay of Fundy, had shipbuilding industries in 19th century. It is reported that approximately 30 shipbuilders have built over 80 vessels in Dorchester in the 19th century. William Hickman is reported to have built up to 25 vessels at Dorchester Island and four in Hillsborough. William Hickman was one of the most innovative and prolific ship builders in Atlantic Canada. Vessels built at the Hickman yard on Dorchester Island had reputation for being safe, sturdily-built craft made from the finest building materials and with quality workmanship. The Joseph Hickman House is recognized for its association with the lumber industry. Joseph Hickman and most of the Hickman descendants were farmers and tradesman and had share in several ships. They also contributed to shipbuilding by supplying timber and hardware. As early as 1840, Joseph Hickman operated a general store. It provided supplies for lumber camps and shipyards. In 1876, Joseph built a new hardware and specialty store. The Hickman’s also owned sawmills in Dorchester and in Port Elgin. The Joseph Hickman House is recognized for its association with farming. The Hickman family had a large farm and was recognized as a model or “experimental” farm. In a document prepared at the time of his death in 1889, it is mentioned that Joseph Hickman’s estate was worth $31,893 at the time. The Joseph Hickman House is recognized for its architecture. Built circa 1840, it is a good example of two-storey Neo-Classical residential architecture, exhibiting a depth of two rooms and using a strict symmetry arrangement of elements. The paneled front door is framed by a transom window with sidelights. Multi-pane windows are arranged symmetrically five across. The interior is lavishly finished with elaborate door and window moulding, intricate staircases, plaster crown moulding and rosettes, a plaster arch in the hallway and numerous fireplaces, including a rare cast iron fireplace made in Sackville. The article also contains architectural details on the house and some photos.